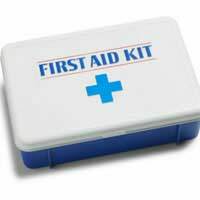 Whether you employ two thousand people or work alone at home, the First Aid Regulations (1981) apply to you. Here is an overview of your obligations – for a detailed summary, look up the Code of Practice at HSE online. The First Aid Regulations are applicable in all workplaces, whether there are lots of employees or just one, home-workers should have a basic understanding of the law. The Health and Safety Executive (HSE) recommends that self-employed people carry out a risk assessment in their workplace, just like other employers. If you rent office space that is shared with other self-employed people, it’s a good idea to make a joint plan for first aid. Make sure that this is documented and signed. This could involve training one or two First Aid representatives and equipping the premises with an adequate First Aid box (dependant on the types of work and risk that you have). Although an assessment sounds complicated, for those working from home offices, it’s quite straightforward. You should consider the risks in your office when you plan your First Aid provisions: do you carry any heavy loads or have a tripping risk? For most home-workers, a domestic First Aid box will be sufficient. Don’t forget to also consider people who may be affected by risks presented by your workplace, such as children and passers-by (if you work outdoors). You’re not legally obliged but it makes sense to plan for their risks too. All employers should make two basic provisions to cover their workplaces: An adequate First Aid box, and a trained person or people to administer First Aid. Before putting a First Aid plan in place, you should consider the risks at your workplace. Do employees work with hazardous materials or chemicals? Do they work at height, operate machinery, or use high-risk tools? Can your workplace be separated into high-risk and lower-risk areas? A good plan tackles all of these questions. When you have identified specific risks, you can make a list of appropriate safety and First Aid equipment: for instance, safety rails for employees working at height, eye goggles for use with machinery, and medical provisions to deal with any accidents that may occur in different parts of the workplace. If you have a high-risk area, it is appropriate to have different provisions in this area than you would have in a low-risk office space. A typical First Aid box might include assorted sterile dressings; eye pads; wrapped triangular bandages; wrapped, medium and large wound dressings; disposable gloves; and safety pins. You will need to have a number of trained First Aiders to cover your workforce, making considerations for any employees who are disabled or inexperienced. For low-risk environments like shops and offices, the recommended number of First Aiders is 1 per 100 employees; for medium-risk workplaces like warehouses and processing units, it’s 2 for the first 100 and then 1 per 100; and for high-risk workplaces, HSE recommends training 2 people per 100. The HSE supplies information about registered First Aid training. You should put up signs so that other employees know who to call on for First Aid. For more information and a useful checklist for employers, visit HSE.gov.uk.